Tonight Ian, Sam and Julie will head up north for our church's Fall youth retreat. It's Julie's first one and she's so excited. I'll miss them all so much but my hands will be full in their absence with the two littles to keep me busy! I'm looking forward to lots of cuddles and playtime this weekend. And early bedtimes... let's be honest here. I don't know what's going on with my mouth these last couple of days but there's an excess of saliva going on and I'm worried my tongue is going to drown or something. So gross. I checked WebMD and it turns out I'm dying. Well, I can't sit here chit chatting with you all day... I need to get to work. 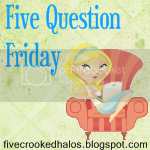 So let's get this Five Question Friday started! 1. What is your favorite fall family tradition? Definitely our fall family photos. No one ever wants to do them but me and it usually ends up being a frustrating time for everyone. But it's all worth it to get that one great wall-worthy shot. I love seeing our family growing year after year. 2. If money weren't an issue, how many kids would you have? For me it isn't so much the money aspect, it's my age and my ability to split myself up to give each child what he/she needs. I love having four children but I don't think I could handle more. I'm pretty stretched as it is. 3. If you were to get a tattoo, what would it be and where would you put it? 4. What condiment is a must in your house? Oh my gosh KETCHUP. Heaven forbid we run out of ketchup. Or as Jordan calls it, "kepitch". 5. How did your spouse/fiance propose? That's a long and beautiful story, ending up with him on one knee just as I'd always dreamed. That's a wrap! Head on over to Mama M's blog My Little Life to join in on the fun and meet some other awesome bloggers! "Best question he ever asked"....Love that!! :) Have a wonderful day friend!! Love it! You need to tell your story. I love hearing people's engagement stories!